Protesters backed by Bianca Jagger have been banned from using "direct action" at two oil and gas drilling sites. An interim injunction has been granted against "persons unknown", after UK Oil and Gas Investments (Ukog) claimed some activities were unlawful. Ukog chief executive Stephen Sanderson said the High Court judgement upheld its right to conduct lawful business. But Friends of the Earth said the ruling had "far-reaching consequences for free speech". Protests at sites in Surrey and Sussex have included the construction of a "fortress" and network of tunnels. Other campaigners have obstructed access with slow walking in front of vehicles and events held at site entrances. Lawyers for Ukog and four of its subsidiaries said some protests were intended to interfere with its "economic interests". It asked for a ban on a range of activities around its sites at Broadford Bridge in Sussex and Horse Hill in Surrey. Five campaigners, including actress Susan Jameson, and Friends of the Earth were defendants to the High Court action. At an earlier hearing in March, Ms Jagger, the former wife of Rolling Stones' frontman Mick Jagger, said Ukog's "attempt to silence environmental defenders" with an injunction was "an attack on freedom of expression and democracy". Granting the interim injunction, judge John Male QC said protests on the highway were permitted but "the rights of others to use the highway must be respected, as must the rights of the claimants to pursue their lawful business activities." However, he refused to grant an injunction in relation to Ukog's head office in Guildford. He also said other activities - including publicising protests and monitoring sites - should not be banned. Dave Timms, head of political affairs at Friends of the Earth, said: "While Ukog have suffered a set-back today, we remain concerned that the injunction has far-reaching consequences for free speech, so this isn't over yet." "I am appalled that residents of south-east England are being threatened with intimidation and censorship for speaking out." 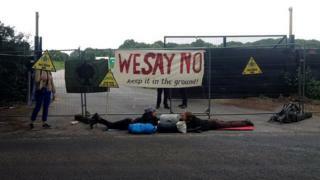 Ukog's chief executive Stephen Sanderson denied the injunction sought to remove the right to peaceful protest. He said: "It sought solely to gain a judicial determination of whether certain damaging actions employed by activists at our sites constituted peaceful, lawful protest or were unlawful." After the ruling, the Weald Action Group said it would "fight on". "Dissent is not a crime and the penalties for breaching an injunction are severe. "We do not believe that powerful private companies should be able to use the law to silence and intimidate campaigners," it added. The campaigners said they are considering an appeal.